For the last three Fridays (and I think a Wednesday in there too…) Rick and Jackson Lowell have been coming over to play Hordes of the Things. 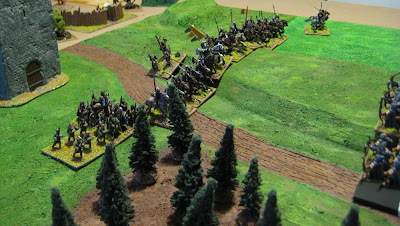 Because I’ve been insanely busy preparing for the HOTT Campaign weekend – along with the multitude of other spring activities I just haven’thad time to write up proper battle reports… Below are a few pictures of the games I’ve taken. 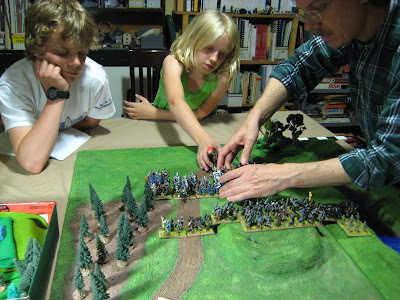 In all of these games Rick played the Elves and Jackson played orcs. 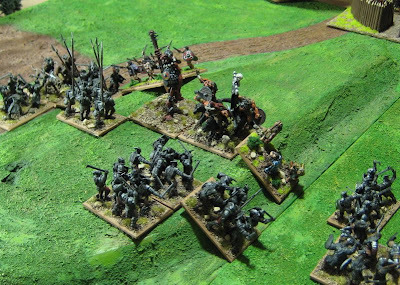 They have been trying out different combinations of available options for their campaign armies. This was a game Rick and Jackson played against each other. 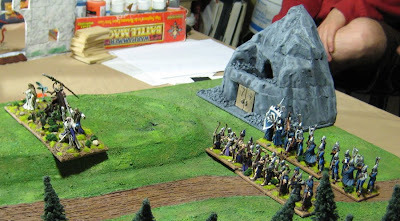 Rick was also trying out the new mountain stronghold as I hadn’t finished the Elf “stronghold” yet. Rick sends forth the Triple-Wizard-Combo in an attempt to ensorcell Jackson’s hero General and harass the Behemoth. 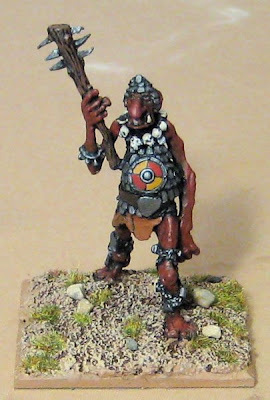 The Orcs General (not liking the looks of those wizards!) 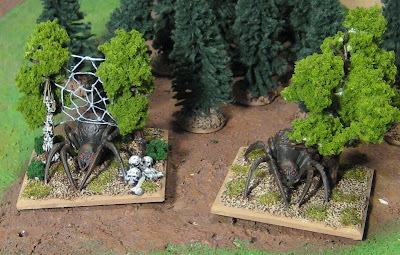 and beasts peel off to flank around (or through) the woods in the center of the table. Sparks and loud bangs scare away the Giants! 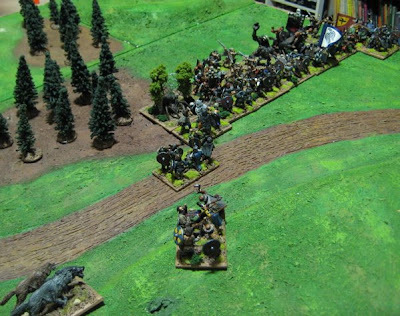 The Hero General and Wolves made it all the way behind the elves who were forced to redeploy to defend their stronghold. 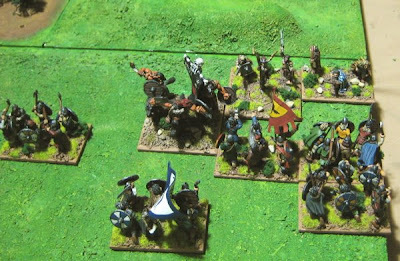 The rest of the evenings I’ve been playing various armies against their forces – here I am playing the Normans against the Elves. 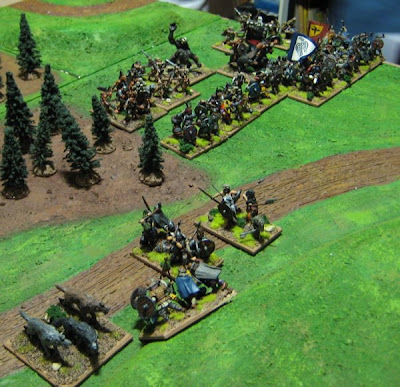 That same evening I played the Vikings against Jackson’s Orcs. He had a Hero General, a Behemoth and a Cleric – I took all regular 2AP troops and so outnumbered him some and was able to use that to my advantage. 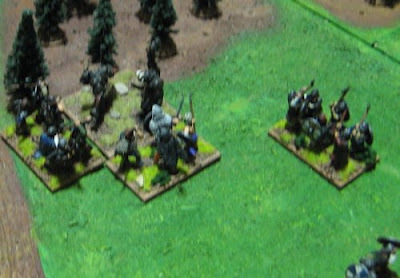 Jackson really, really wanted to try and outflank wm with his beasts… the problem is it’s not easy to outflank an opponent that outnumbers you… one beast was killed as soon as they came out of the woods (like I was going to go in their and get them…!?). The other did tie down two stands of Blade for a few turns. What’s wrong with this picture…? A: the Behemoth is in a position where if it loses the combat and recoils it with crush BOTH armies Generals!? Which was a sacrifice I was willing to make as his general was a Hero (4AP) and mine was just a blade (2AP) and I think he had already lost more than me so that would have ended the game and I would have won. WelL I didn’t push behemoth back.. in fact the trolls pushed my guys all the way back to the woods – where my Warband caught them and took them down. 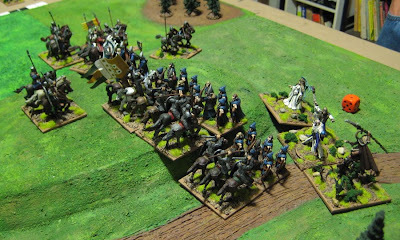 I think this is a shot of what was left of his army at the end of the game… Hero General, Cleric and a shooter…? 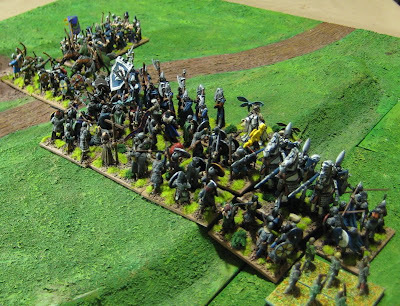 The Next week I started off with the Saxons army against the elves. This time Allie was helping Rick command the Elves. … then just started turning flanks and working my way in! Then Jackson and I played a little Orc on Orc action. 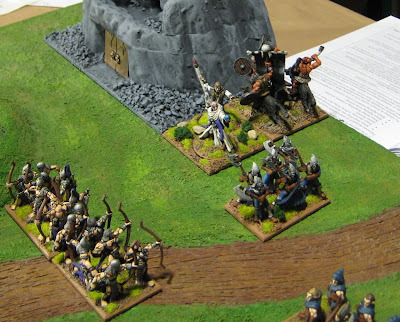 He killed my Blade General but had lost more stuff so we carried on – me being slightly less maneuverable.. 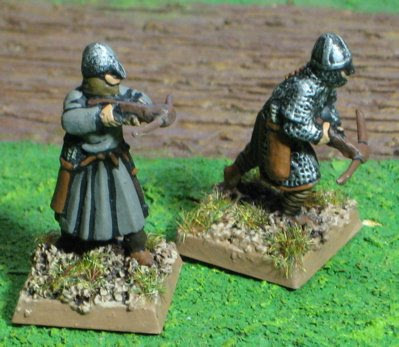 These are, I believe, Medieval Axemen from Old Glory. I didn’t really paint them because they were needed for the HOTT Campaign Weekend… I painted them because they were easy, and Chris could take them home (They’re part of the pile o’ stuff that he sent to paint…). Not sure what he’s going to use them for so I’ve left it to him to make a flag for them! A Dwavish Druid/”Cleric” stand. 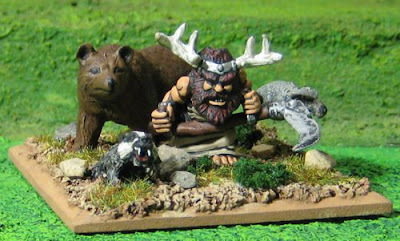 The Dwarf druid and badger are Reaper Miniatures, the Irish wolfhound is from Gripping Beast, and the bear – believe it or not – is just some cheap, junk, plastic, made-in-China toy that just happen to be about the right scale…. 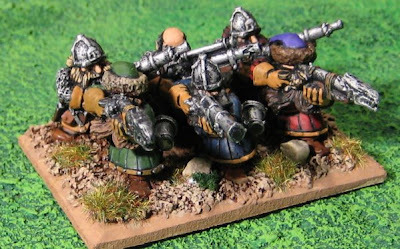 Some Dwarf Handgunners ("Thunderers") from Games Workshop. 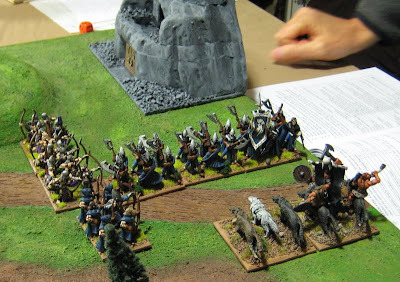 I still have a couple more Vikings and Orcs/goblins I’d like to finish up – but I think I’m going to concentrate on the Map and some terrain for the next couple days… ONE WEEK to the HOTT Campaign Weekend!! 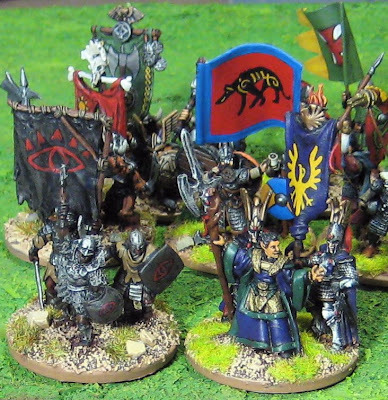 The two latest additions are the Elves and LOTR Orcs (in front). 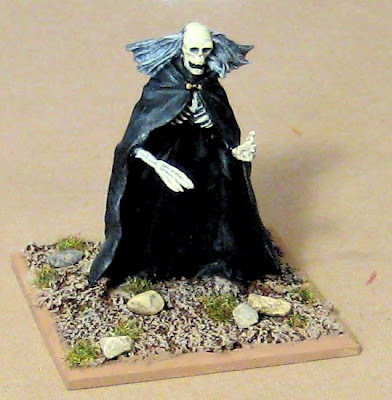 The Elf Wizard is a Reaper Miniatures figure that I painted some time ago and just rebased to add to this stand, the rest are from Games Workshop. My Love For You is Like a Truck – BERSERKER!!! 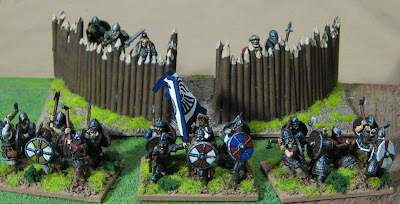 Two are from Old Glory, the two with the wolfskins are from Gripping Beast. Shield design inspired by Neldoreth. Maybe I should add the option of a shooter…? 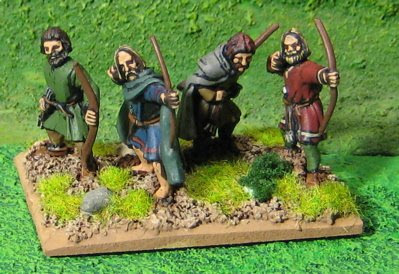 I don’t have any specifically Viking archers or anything though… I do have a heap of hairy lookin’ Welsh archers that might make due…. Hmmmm. 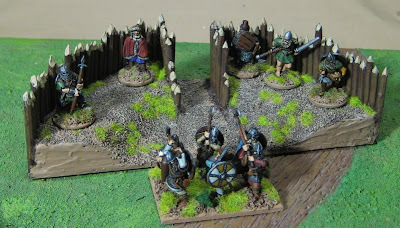 I had already done the Viking and Saxon ones, and started on the Norman ones, ages ago. 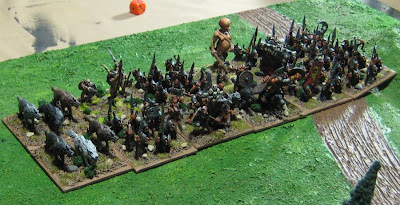 Originally I had a notion that I was going to do Warmaster Ancients in 28mm and they were going to be command stands. I have long since given up that idea (having too much fun with Hordes of the Things and DBA), but I still had these stands around and that’s what gave me the idea. 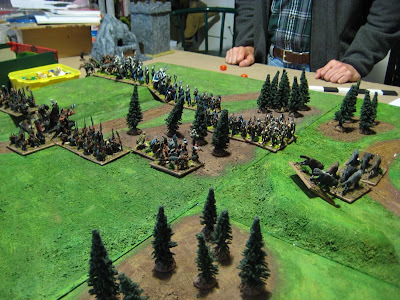 I’m going to also paint a big map of the campaign world and use these markers to indicate where the armies are at. I think I might give it away as the prize to the winner of the campaign - "here ya go- a map of the world you've conquered..."? I still need to finish another Orc one (or two…) and the elves. Another Behemoth. I’ve had this figure for very nearly 20 years. I have no idea who the manufacturer is. It has haunted various boxes in a half painted state for 99% of that time and, dammit, he’s finally finished (I think he was rebased at least three times before I ever finished him…). Not a new paint job, but a re-base and something new to the HOTT arsenal. I think this is a RAFM figure and I’ve had him about as long as the giant – though of course this guy was painted almost immediately – and has been rebased a few times. I’m planning to make him available as a “god of death” for any HOTT army that cares to conjure him. We haven’t tried using gods just yet, but now if anyone wishes… they can do so… We seem to be a pretty conservative group around here – no on e seems to be interested in the very volatile units – gods, dragons, etc. 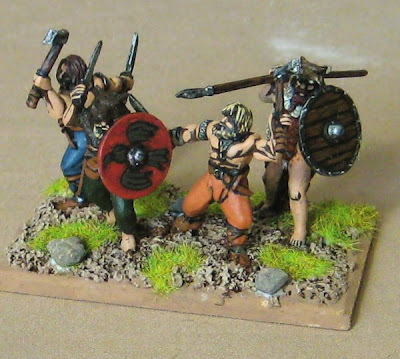 I cranked out enough figures for another stand of Berserkers for the Vikings (Warband) – I just need to finish the base. 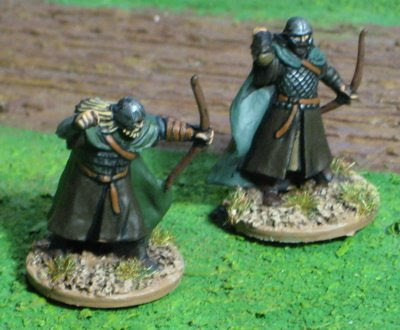 Then I need to finish the Elvish and second (and maybe third) Orc army markers… Then finish off the Uruk-hai Pike/Spearmen…? 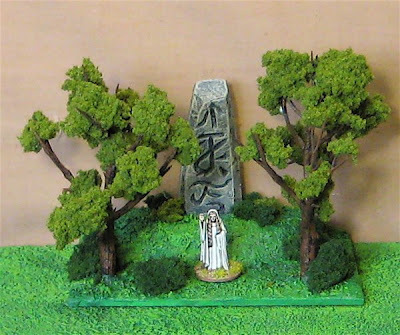 A standing stone in a glade – a stronghold for the Elves. The Return of Savage Saturday...? I haven't played Savage Worlds in a while. A couple of my regular players quit and I've been... well... a little focused on other things lately (HOTT). Last night I ran a little WW2 scenario set on the coast of Occupied France in 1942. A small group of British Glider troops landed on coast to meet up with a German professor who had been involved in Nazi Super Science projects and wished to defect! After locating the professor the party was to retreat to the coast where they were to meet with a party of Royal Marine Commandos Who were to whisk them back across the channel. A full after action report with pictures can be located over at Savage Timmy's Playhouse. 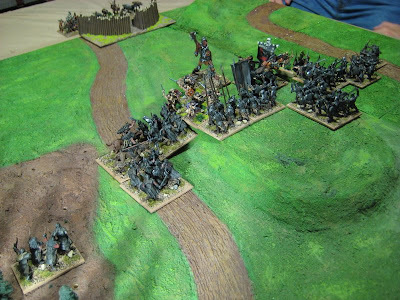 I have three stands of pike/spear just about finished as well… This will complete the foot contingent of my Army of Isengard. Indeed right now I have 26AP ready to fight! I finished up a few Strongholds for Hordes of the Things in the last couple days. I think I need to get another one or two for the Campaign weekend. The first I made was a Mountain fortress. 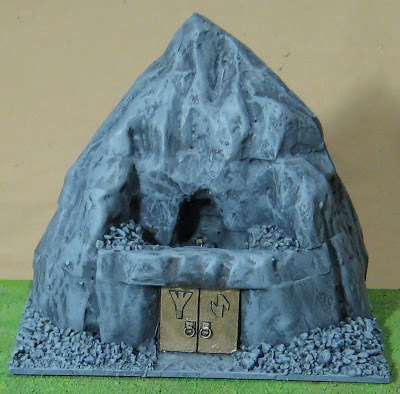 This will nominally be the Dwarves stronghold, though it could potentially see use as a Orc or Goblin stronghold – or maybe even for the Wood Elves of Mirkwood…? Number two is a generic palisade fortress. 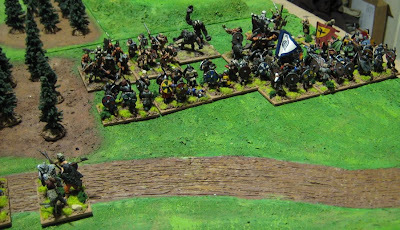 Also a versatile one that could see use with the Anglo-Saxons, Vikings or Orcs – possibly others in a pinch. I think I might make a quick and simple elf one next – a stand of trees with a standing stone in the center… or a magic pool…? I finished up a few Highland Dwarves. 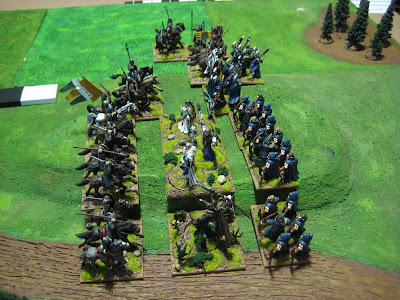 Most of these are Ghost Miniatures from Old Glory, but the piper on the stand is a converted Reaper Miniature. 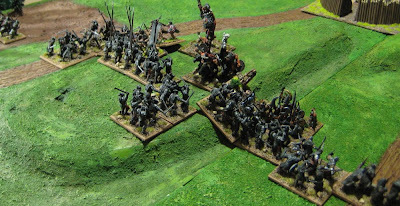 Spares… after painting some Rohan Archers (scroll down, they're near the bottom) for a HOTT stand I had a few left over so I based them individually for skirmishing. 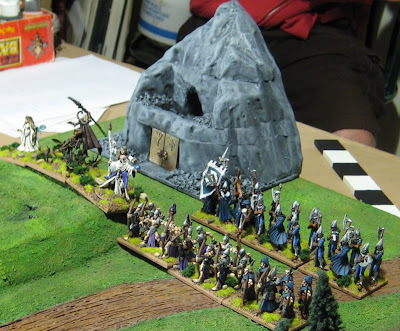 I FINALLY finished up my Saruman/Magician stand for my HOTT Isengard Army. 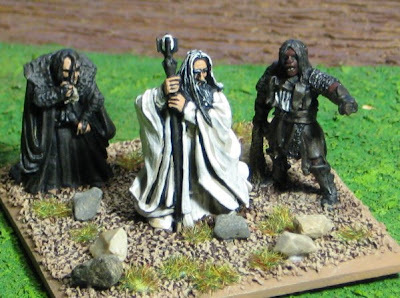 Saruman and Grima were finished weeks ago, but it took some time to get the pointing orc for a reasonable price off of Ebay… These are all Lord of the Rings figures from Games Workshop. 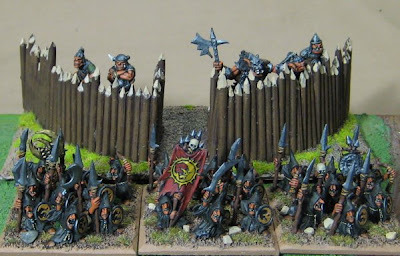 I now have three stands of the fiends for HOTT now as well… I have enough, currently, to make three more stands… I may just have to get a few more so I can field an entire 24AP army/command of them!!! 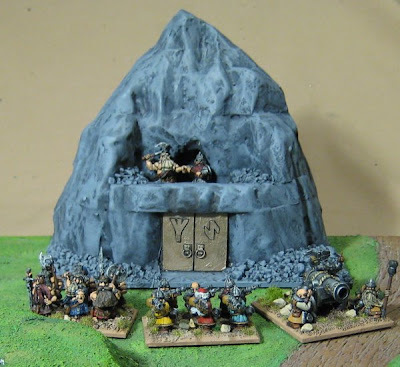 West Wind Productions also seems to be making some highland Dwarves now… I may have to pick up a few of them… just to add some variety…! ?